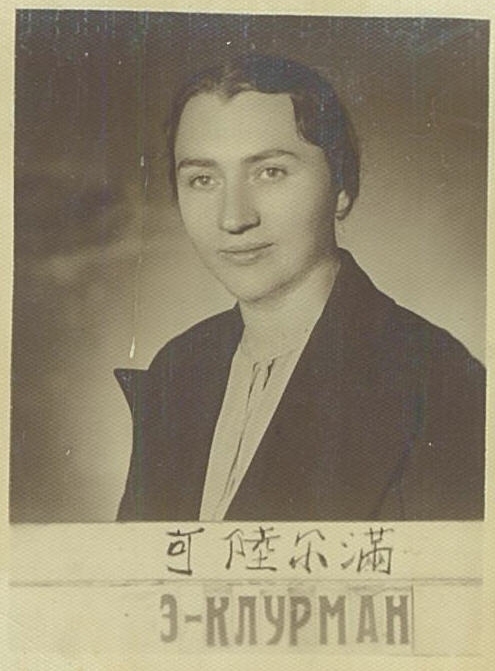 Daughter of Naum and Yelena Keilis and oldest of their eight children. The following narrative was transcribed from a tape made October 28, 1982, in Reno, Nevada. The interview, transcription and editing were done by Irene Clurman, Ethel’s granddaughter. Ethel was a native speaker of Russian and her grammatical errors in English were left unedited. The editor’s comments and explanations are in parentheses. My father (Naum Keilis) left Odessa in 1903, went to Harbin. In 1904, my father visited us (in Odessa) and afterward, he left (to go back to Harbin). In 1905, the pogrom broke out in Odessa. My mother (Yelena Keilis) was pregnant already. My mother’s younger sister’s wedding was that day. And usually, in Russia, the wedding was in the yard, under the sky under that canopy. And the wedding reception, usually you rent a hall. So my mother went to set the tables, everything, when my aunt’s fiance came and said that they are killing Jewish people. My grandmother stayed with us – that’s my mother’s mother. When she heard that, she was in tears. Finally my mother came. She was stopped on the way. They asked her, “Ti xhidovka?” (Are you Jewish?) And she said “Nyet.” (No.) And she had on a headscarf. My mother looked Russian, blond, blue-eyed. And that saved her. She came home. So there was no wedding and there was no reception, and we went to the attic. You know, in Russia, on top of the house, there’s an attic, not inside but outside. And we went there, no food, nothing. But we had a Russian maid. It happened that she gave birth to an illegitimate child, and in Russia, at that time, with a child, nobody wanted you. So my mother hired her. And she brought us food upstairs to the attic. Yes. Well, it lasted a few days, the pogrom. We were dirty in the attic, not washed, nothing. (This man), he was a barber. He went to Harbin , he couldn’t get a job, nothing, and no money to go back, so my father gave him money to go back, help him out. So we went down, they gave us water to wash ourselves, food, and we stayed there til the pogrom was over. The hooligans they approached. The houses in Russia are built (around a) courtyard. So there was an iron gate, closed. They approached it. In front, there was a Greek café. The (Greek people) came out with an icon and they (swore on the icon) and said, “There are no Jewish people here.” And (the hooligans) left. That’s how we were saved. After that we came to Harbin and we lived in Harbin, settled there. There was no place to live. We were at that time three children already. My brother was three months old. My mother, my father, we lived in one room. My sister Nina too. She is in Russia, I don’t know whether she is alive or not. And my brother Sioma. He died (in 1979) in Israel. That book that Pearl Buck wrote - ”My Two Worlds,” I think. When I read, I saw China the way it was when I came in 1905. WHEN MY FATHER CAME (to Harbin), there was nothing Jewish. Absolutely nothing Jewish. There was no shul, nothing, absolutely nothing. That’s why… my parents were not kosher. That’s the reason. Later on, they built a synagogue, there was a Jewish school. There was a rabbi, a shoichet. But when we came, there was nothing. After that, as I say, people were coming from Russia to Harbin and houses started to be built, so we could get an apartment. But the apartment - ice was on the walls! Our winters, you can’t imagine how cold is our winter. Harbin is on the border of Siberia and Mongolia. The winter lasted until April, then the river which was frozen, the ice breaks. It’s windy and from the steppe of Mongolia comes the dust. You never seen such a dust. It’s like little stones. You come home, your face and everything is black, your mouth is full of that. We had a very short summer, it used to start in July. The 15th of August in the evening, you had to put on a coat. You couldn’t go out without a coat. September in the daytime it was nice, warm, but in the evening it was cool. (My mother) came from a kosher family too, a strict kosher family. My mother was Friday with candles, but my father not. He was not a religious man. And when we had so many children, to go and buy kosher meat … we were eight, mother and father is ten, and men that worked in (the family) butchery is eleven, and this fellow and a boy that helped out is thirteen, and a Russian woman that took care of the small children, that’s fourteen people (to feed). Besides, there was not a day that one or two (more) wouldn’t come. So how much meat we had! That’s one thing, my mother, when we had filet mignon, everybody ate filet mignon. Then my father used to send -- it’s a French word, we use it in Russian -- “entrecote.” It’s the prime rib. So everybody ate entrecote. My father hated ground meat. (We ate) only good meat. But to go and buy it (kosher) was impossible. So I didn’t grow up on kosher meat. It was enough that my father could support us. Can you imagine eight children? We were all well dressed, well fed. We lived very good. Not like some people who say they get up in the morning and not to find food. I didn’t know that. My mother, her bread was delivered. Loaves of round bread. And bagels, I don’t know how many bagels were delivered. My sister Nina, she went to school, she graduate the Russian school and there was a hospital where you could study to become a registered nurse. And when she graduated a registered nurse, she wanted to become a doctor, and there was nowhere to go to be a doctor. And at that time the Revolution broke out already in Russia, so she went to Russia. She went to university there in Tomsk, Siberia. I went to (elementary school at) Gymnasia Oksakovskaya. Mainly Russian people. But in Harbin, there was no discrimination. The (Russians) wanted to (discriminate), but in Harbin we had a very fine governor, a German. And he said to them, “You can’t do that. That’s not the Russian territory. It’s the Chinese territory. You cannot apply the same law. “ Horvat, very fine governor. There was no discrimination in school, nowhere. You could go to school together. In Russia, you could not do that. In Russia, only a percent (of Jews were allowed into school), just like into university. But in Harbin, there was no discrimination, so I went to school. And then when I was about 10 or 11 years old, I went to Shanghai, was in a convent, in a Catholic convent, St. Joseph’s Institution. It was actually in the French concession, and it was Institut de St. Joseph. That’s the beginning of my English. My parents were liberals. They didn’t worry (about sending me to a Catholic School). They just wanted me to have education. I was there about four years. Then I came back (to Harbin). The reason they didn’t send me back (to school) was my father was in butchery business and he had trouble with cashiers, so he tried me and I stayed there. I was a bookkeeper and a cashier. Retail butchery business, beef mostly. THEN I MET MY HUSBAND (Isak Grigori Clurman). I got married. I was 17, close to 18 years old. I tell you how we met. He courted my cousin. I was a teenager when he courted her. He was in the States during the World War I. In order not to be a soldier, not to go to fight for (Czar) Nikolai, he underwent an operation, and the big toe of one foot was removed. And that’s what helped him stay away from being drafted. There was a doctor, he was a Turk. I remember him very well. I can see him, as I talk to you. He was the one that operated, removed that toe. He started to help out the Jewish boys not to get (drafted) and somebody put the finger on him. He could make that one leg would be shorter, one leg would be longer. So somebody put a finger, and he had to leave Harbin. After the war, (Isak Grigori) came back. He was about two and a half, three years here (in the States). He didn’t like it because he had to do (physical) work and he was a businessman, see? Natan (Isak’s brother) was a window washer in New York and so was (Isak). So right after the war, (Isak) came to Harbin and I was working as a cashier in the butchery. And he brought from the States tire rubber, not for cars – we didn’t have cars – but for carriages. So when he used to sell, he would come and weigh them (on the butcher’s scales). They were sold by weight. And that’s how we started. But I knew him. He courted my cousin. And we courted and he proposed me and we got married. It was the Russian Christmas. The butcheries in China, they used to work six and a half days, only half a day on Sunday was closed. But Christmas was all day long closed. So they decided the only day to get married was on Christmas Day. (Russian Christmas is) on the 7th of January. It’s a 13-day difference. So I got settled, and (her son Charles - Ruvim - Clurman) was born (in 1918). And a few years later (in 1921), Sylvia was born, and ten years later (in 1928), Israel was born. My husband was 15 years old when he came (to Harbin) with a brother. You know what he had? He told me, “I had one ruble and 50 kopeks.” And he went to work with the Chinese. He worked just like the Chinese. Finally, he built up and the Chinese worked for him later. Yes. And without education. Very poor education. His writing was terrible but he used to read every day the paper, Every day. The mind was a brilliant mind. The wheels, they were broken, and the Chinese would come and buy (them) by the pound and make shovels, because (they were) cast iron. The handles the Chinese used to buy also and (they were) brass and they could make things from brass. And from the wood, (Isak) took it to his yard, and he built houses. From the scraps, they built houses. Very little new material went into houses and they’re still there, staying there. (Isak Grigori) was a good working man. He was not an alcoholic, not a gambler, not a skirt chaser, that’s why I married him. Right away when he came from the States, he went into business. He rented a big yard and we had everything in that yard. We had wood, all kinds of wood there. And he built a small house for himself. He didn’t plan to get married. Then (he built) flats and we moved to another place. He was a good provider so (laughs) I didn’t have to do anything. I’ll never forget, (he) once came and said to me, “I married you not because I needed a cook. I can hire a cook. I want you be a wife, a mother and know what’s going on in the kitchen.” He didn’t like me in the kitchen. I liked it. I didn’t cook … but I loved to bake. So I baked all kinds of cookies and cakes and things like that. (Isak) was a hard-working family man. When he used to come home, the first words were “Gdye dyeti?” “Gdye dyeti?” (“Where are the children?”) That was it. The only thing he was short-tempered. But … we say in Russian, “Krasatoo i manyeri, na tarelka ne polozhish.” (You can’t put good looks and fine manners on a plate.) I would keep quiet, he would get over it, and I would do what I want. We never came home (after) going out to a show without bringing the children chocolate. He used to put it under the pillow. In the morning they would know already that there’s something under the pillow. And he tried to give them education. Not educated himself but (Charlie) went to gymnasia, we had to pay gymnasia. (Charlie) didn’t study, he didn’t do his lessons at home, so he had a tutor. He was behind in English, so we had to have an English tutor. Then he wanted to draw -- he draws very good. We had a teacher comes special to learn him to draw. Then we had a Hebrew teacher. That’s what it is. And Sylvia, the same thing, she had the same tutor. She didn’t have an English and she didn’t have a drawing tutor. But she had music, piano lessons. Twice a week with the teacher and every day for one hour used to come a girl the teacher recommended and for one hour, she played (piano) with her. And I had a maid and a governess for them too, because they didn’t go out by themselves. We were afraid to let them go out. Up to five years for (Charlie), I had a wet nurse. From five years, I had a governess. And once a month, I had a woman to help out with the cleaning and then we had a Chinese that took care of the yard because (we owned the) apartment house. So the month would come, can you imagine the expenses? And Mrs. Clurman (referring to herself) would go and order a hat for $20-25! (laughs) Clothes we had to order. You want good clothes. We used to go and buy material. And I had a seamstress and she had all magazines, she had McCall’s and she had Vogue and everything. And I would pick out what I wanted and she would sew. Then I had to go and she would try it on me. We were all well dressed. So as I say, it was a good life, especially for the Jewish people. THE JEWISH COMMUNITY was only 10,000, including men and women and children, and there was two synagogues, beautiful, they were all maintained on private donations. Can you imagine? We had a hospital, it was all built on private donations. We had a Jewish bank, it was built on private donations. We had an old age home, it was on private donations. And there was a cafeteria for people who could not afford to pay. They used to come and if they couldn’t afford to pay, they could pay a quarter and get a full meal for a quarter. And on the second floor there was for the old age people, and people didn’t have to pay. And then they built another place for chronic ill people. All from private donations. I liked always to read. I belonged to the library. I liked good pictures (movies). We used to go. And I liked legitimate theater. There were so many operettas. I love operettas. For the Jewish people really it was a good, good life. But it all changed, all changed. We had to watch the children because of kidnapping. We had Chinese bandits. We called them “xooxooze.” It wasn’t so bad at the beginning, but later on it was very dangerous. (Isak Grigori) used to go to (his) slaughterhouse five o’clock in the morning in winter to start, and he used to carry a big revolver. (The kidnappers took men for ransom and sometimes the victims didn’t return.) Abramovich was kidnapped. He was 19 years (old). He didn’t come back. And there was Galimpolski kidnapped. They paid $25,000 to get Galimpolski (back). Was Raii’s cousin, first cousin. (Raii was the wife of Isak’s brother Nathan Clurman.) Galimpolski came back, but he died. When I came to the States, (a former Harbinite) told me that Abramovich was taken by mistake. They wanted to take (Charlie). We lived Yamskaya Street, it was the sixth street, and they lived on the fifth street, not far from us. But Charlie was already away (in school in California). That’s why we sent Charlie away, as I say. It was very dangerous. They didn’t take women, but they took children. They took men. Boys, men. It was xooxooze. Mostly Chinese. There were probably rings. But when the Japanese took over, there were already Russian kidnappers. They kidnapped Kaspe. There were still Russians there and the police were involved in it. They kidnapped Kaspe. They killed a butcher. He was driving -- they had like those horse race carriages called an “Amerikanka.” He was riding to the slaughterhouse and they attacked him. They probably wanted to kidnap him, but they shot him and he died. So life was not easy. It was dangerous for people who were well off. WHAT HAPPENED (IN 1938) IS TERRIBLE. Only Izra (Johnny) was home. (Charlie) was away. Izra was ten years old. (Isak Grigori) promised to go with me shopping. I loved to go shopping with him. Shopping not groceries but goods! I could buy what I wanted. Well, it was twelve o’clock, he didn’t show up. One o’clock, two o’clock. It made me real angry. Then came night. Izra went to bed. He had his own room. I went to bed. But I was so angry. And that’s true. He would come late at night, twelve o’clock, eleven, but always (he came home). That’s when I came to my senses. And I was waiting maybe for a letter ransom, something like that. I was afraid to say. There was only the manager and grandfather and me and Izra. A few hours later, he came again. So I went to report to the police. When my husband left the house, the whole building changed. They (Japanese tenants) stopped paying rent. They used to come drunk. They beat the Chinese. They smashed the windows. Izra and I would stay in fear. I’d rather not to think. And the manager started to take advantage of me because I was afraid to open my mouth. “Papa was also a grown person,” he said. THE GOOD THING WAS JEWISH PEOPLE were not persecuted. We had no pogrom. In Russia, before a holiday, Easter or Christmas, Jewish people were afraid. Because usually before holiday, the hooligani used to get drunk. So who’s the scapegoat? Is the Jew. In Harbin we didn’t have that. We weren’t persecuted. There was no discrimination. And business was very good. Anti-semitism started after the Revolution, when the White (Russian) officers came. That’s when it started. We had fascists then. (Some Jewish people were religious), some not. But as I say, they kept up the shul. Beautiful, two synagogues, built on private donations, and on private donations (they were) kept up. Two synagogues. At first it was built one, but when more Jews came it was too crowded, so they built another one. We used to call it Staraya Sinagoga, Novaya Sinagoga (Old Synagogue and New Synagogue). And they built a Talmud Torah. That’s a Jewish school. They taught in Russian but they also taught Hebrew. (Charlie) didn’t go there. But the boys that went, when they went to Israel, it was easy on them. Because they knew Hebrew already. They could read and write. They couldn’t speak but they could read and write. You could get a job. Dr. (Abraham) Kaufman started a Jewish community. Started meetings, and people were elected to the Jewish community and that’s how it grew. And the Russians after the war, the Russians deported him because they said he was a Zionist. That’s true. He was a Zionist all his life. He was educated in Switzerland. His parents were wealthy people. He was sent from Russia to Switzerland. He was the one who organized. He was the president of the Jewish community. The Russians deported him because he was a Zionist. And he said, “Yes, but I was a Zionist before the Revolution. I was a Zionist since my college age.” Finally they let him go to Israel, and he died in Israel. Then there was a Jewish organization, Brit Trumpeldor (Betar scouts). (Charlie) belonged to it and Sylvia belonged to Brit Trumpeldor. When the holidays came, they used to make a stage play. It was beautiful. With an Israeli flag and all walking in. But then as I say, after the war, some young people went to Israel because there was nothing for them to do in Harbin. We didn’t think of going to Israel. We lived in Harbinand that was our country. My father, my family, during the last war, (they) were in Harbin. When the first war (World War I) broke out, we didn’t feel there was a war. But the second war, we felt because the Japanese occupied Harbin. MANY PEOPLE FROM HARBIN were in Shanghai. Harbin was a Russian town and Shanghai was a foreign town, so everything was different. But they had modern houses and hotels, 15-16 floors. We didn’t have that (in Harbin). Three floors was the highest. And there was a Japanese store that was four floors. But in Shanghai there were elevators. It was different. And we had furnaces in Harbin, we had to use coal. In Shanghai it was gas. In Harbin there was only 800,000 (people). In Shanghai there were millions. And it’s very poor in natural resources, Shanghai. Everything had to be imported. While Harbin was very rich in natural resources. That’s why Japan moved into Harbin. It’s near Japan and it’s very rich in anything. They started to send (resources) to Japan so we couldn’t get nothing. From Mongolia we had beef. Cattle. Wild partridge, pheasants. You could buy a pair of pheasants, a female and a male, for 50 cents. It was delicious. So tasty. All kinds. We had wild game. Sheep, anything. Milk. Everything. Iron, wood, coal. In Shanghai there was nothing. Absolutely nothing. Have to import. Shanghai is a beautiful city, international city, but the climate is horrible. In Shanghai you can be on the 15th floor and everything turns green and it smells. So there’s nothing much I can tell. I was so glad when I got out of Shanghai. But (Harbin) was a dream. (In 1949, Ethel and Johnny left Shanghai for San Francisco, where Charlie was living. Sylvia made aliyah to Israel). BEST MEMORIES OF HARBIN, best memories. Now sometimes I hum to myself a Russian song … We used to sing with the Russian people, we used to dance. But then with the Revolution, there was trouble (with the Russian anti-Semites). (Charlie) was once in a fight. We were on a way to a show and we saw the Jewish boys running and (Isak Grigori) said, “We are going back home.” (Charlie) was hiding and some more Jewish boys were hiding (in the house). My husband had a big cane and (Charlie) had taken that cane and hit somebody on the head. So we told the Chinese to lock the gate and not to let anybody in. We were so happy when we got him out of Harbin because on the word “Jew,” he would fight, and how. And he broke that cane in half. It is not easy altogether when children grow up, especially in Harbin, was very hard, and that’s after the Revolution. Chinese never threw a stone at you. Chinese never molested a child, no. So I have the best memories of the Chinese people. But after the (Russian) Revolution, yes. It was terrible.